Sedigheh Vasmaghi the Islamic scholar ,writer , researcher and speaker of the first Tehran City Council , after return to Iran was arrested and released later , but on Oct. 22 after summon to Evin prison , she is arrested again and currently is in Evin Prison. 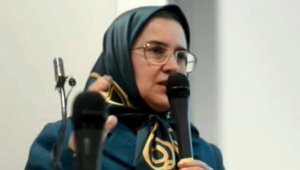 Apparently in a 12 minutes of court session , judge Moghiseh , asked her to prepare 3 Billion Tuman Bail , but Mrs. Vasmaghi was unable to prepare the bail , therefore was ordered to stay in prison . She is currently in women ward section of the Evin prison. Link Video on Mrs. Vasmaghi's speech in London University.